It’s mid-February and a Syrian mother and her two children drown in the sea attempting to reach Greece from Turkey. 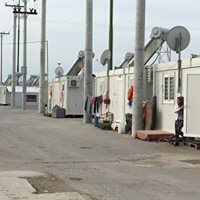 Mike Davis and Wendy Pettifer report on a Greece Solidarity Campaign delegation visit to Scaramanga camp to discover living conditions and what support is needed. Over 2000 migrant refugees live in this camp, a converted Greek navy base on western side of Athens. Grey containers arranged to make lego like streets radiate around the camp. All have toilet and cooking facilities with drainage and electricity. At first sight the camp could be a storage depot. But after greetings from two friendly officials from the Greek government Education ministry we become more alert to small groups of people moving around the camp. First a group of Kurdish women with children were queuing for some clothes. Then we moved across to the nursery and mother and baby area. These are well furnished inside with toys and a huge store of nappies. The children in the nursery are playing and volunteer staff facilitate activities. (The EU provides E3m for the nursery and pre-school provision). The medical centre is the most impressive feature with a section for health advice, a clinic, another for psychiatric support. Currently run by Red Cross volunteers from Spain and Greece they were about to leave to be replaced by Greek health staff. Commonly when Red Cross and UNHCR staff leave the host state finds resources hugely stretched and services suffer. A poster of 30 different faces reminds you of the realities. Headlined ‘Have you seen this person?’ we are reminded family separation is an ever present strain for many refugees living in the camp. Further on we see a football pitch, with many young men playing. Further round a makeshift cafe. Dotted around the camp are small market stalls where enterprising refugees have bought produce to sell on the camp. The camp has been established since 2016 when over 4000 refugees occupied the site. Clearly huge improvements have been made. Every day the camp sees a turnover of 50 to 60 migrants. Some go to flats others are successful in asylum applications. These days Germany only takes 50 refugees a month, other EU countries virtually none, so securing asylum status is no guarantee of being able to move to a third country. Originally the occupants were Syrian and Iraqi, now Kurdish migrants make up the majority on the camp. We met a Syrian musician who had been in the camp for over two and half years. He was desperate to get to Germany to rejoin his wife and three children. Doubtless this experience is replicated by many in the camp. Most want to move on but the Greek authorities are making life as good as it can be in the circumstances. The biggest scandal is the 500 children, many unaccompanied, living in the camp. Britain has made a commitment (the Dubs amendment to take 600 unaccompanied children) but little or no action is evident here (see below). Currently only six unaccompanied children had come to the UK from Greece. There is a desperate need for prams and baby milk. Many children go hungry with only one meal a day if they attend a school. Six primary schools and one secondary school are now taking children from the camp. We heard of some children wanting to go home for lack of food. Officials at the Ministry of Migration acknowledged Greece was still grappling with significant flows of migrants. 3270 unaccompanied minors were a big challenge with 1300 newly arrived between August and December 2017. Although 820 places had been created in hotels with many more in shelters help was needed. The government was providing around 18 staff including social workers, medics and legal advice workers. The Dubs proposal had actually only seen six children supported by the UK with a mere 90 places offered, way short of the hundreds of places pledged. The UK had washed its hands on relocation. Officials confirmed all children in the camps or centres can go to supplementary schools with 6 to 15 year olds attendance obligatory with schemes starting for over 15s. All those in camps and centres receive 150 Euros a month. While initially NGO staff were in the majority now 90% of staff were local Greeks. Situation in Lavrion raised the issue of dispersal versus keeping a community (in this case Kurds) together. Lavrion is an established hub for mostly Turkish speaking political and other refugees from Turkey, which may have some possibly sensitive political dimensions (in the current extremely tense Greece-Turkey relations – right now there are skirmishes in border island areas and open threats by Erdogan’s Turkey to invade up to 18 islands reported in the Turkish press). It is threatened with closure. It plays a key role in the reception and support of new arrivals, but the main concerns of the Turkish speaking Kurdish diaspora are wider. The Greek government’s position appears to be rather sensitive. 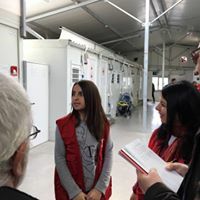 The fact that the facility has been until now run by the Red Cross/UNHCR (who haven’t expressed any concerns to our knowledge) and that it is supported by Solidarity for All, suggests it is operating effectively. The wider issue of the Red Cross withdrawal from the camps is not because it is not needed anymore but because it is their policy to not stay permanently in any camps, expecting the local government agencies to eventually take these facilities over. The delegation agreed to speak to the Turkish speaking Kurdish community in London to simply facilitate contact and establish a dialogue to identify the issues in what way the Greek government and the Kurdish community might resolve them. Our Medical Aid for Greece arm will continue to help with fundraising for modest items (like the newborn baby prams, baby milk supplies, packed lunches for school attendances etc). A day earlier we visited a converted print works in the Exarchia area of Athens, home to five floors of amazing innovative support services for refugees and asylum seekers. 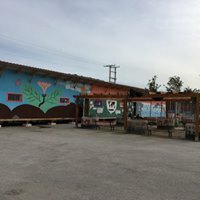 The ‘beating heart’ of the project is the kitchen and cafe where migrants can prepare food and eat together. Joey and Effy did the introductions. Volunteers at the centre provide legal advice on asylum applications, family reunion and general welfare. Khora was established as a result of Bristol Skiptchen, a project of cooking recycled food for the homeless and poor in Bristol. A contingent came to Greece in 2016 to provide hot foot for refugees. From the islands the volunteers moved to Piraeus and extended the project by recruiting volunteer lawyers. 50 per cent of volunteers today are from the refugee community. Refugee Legal Support (RLS) was initially funded by the UK-based ILPA as a pilot starting with advice, a drop-in clinic and a triage service. Now the project runs purely through unpaid volunteers and mainly overseas donations. The Centre is funded almost entirely from overseas donations. Running for almost a year the volunteers see migrants from the camps and those in flats and hostels. The majority are Afghan. There is a pool of interpreters from the refugee community. Joey emphasised a good relationship with the Greek asylum service and housing ministry. Volunteers do outreach in the Afghan church, market stalls and community centres. At least 10 people a day come through the triage service. The project is currently supporting about 100 people a week. The trend is to move from advice to casework. There are huge delays with family reunion. Asylum applications can take up to two years. Even when approved there is no guarantee of moving on to another country. 16 to 65 is the age range with mainly men using the service with a partner or children in another European country. The Centre closed for two days recently due to fear of attack from nationalist demonstrations. The schools reception facility provides no systematic oversight. ‘There is more humanity in the system in Greece’, volunteers stressed. Solidarity for All reported over 1 million refugees had passed through Greece since 2015. Every point of entry had received migrants. The situation on the islands is at breaking point. The authorities are finding it difficult to cope with facilities stretched to the limit. The Greek government is doing a good job in supporting migrants into school with lots of grassroots organisations campaigning to support. Thousands of unaccompanied minors in Greece, especially on the islands, have no access to education and access is limited even to those with families. The service provided by Greece in collaboration with international NGOs is woefully inadequate . This is not the fault of the SYRIZA government. They don’t have the financial resources, even given the large sums of money from Europe and the UN, to meet the refugee need. The only solution is a more even distribution of refugees outside the Southern European states and an effective family reunion process. This particularly means the UK must take a much bigger share of refugees and honour its commitment to unaccompanied minors as enshrined in the Dubs amendment. Sofia Tzitzikou, a trained pharmacist who used to work as a volunteer with the Social Solidarity Pharmacy KIFA at Ommonia, works with UNICEF Greece. She informed us that there are around 60,000 refugees stuck in Greece with more arriving on the islands every day. Of these there are 3,000 unaccompanied children in Greece. Some children in the refugee camps in Athens & Attica have been moved out into hotels, apartments or to camps elsewhere where there is 24 hour specialist support and supervision. What next? – Some now go to school but are not motivated because they think they are going onto Germany. On the islands the numbers are far more than the camps can deal with. The conditions are desperate and the people get frustrated and angry. When the refugees started to come into Greece in huge numbers, the response was quite chaotic with many unregistered NGOs active and no transparency over funds. In the last year most NGOs registered by the government and funds have to go via the Greek ministry so everything is accounted for now. European funding to support refugees was first channelled via NGOs. As from now on, EU refugee funding will come to the Greek government. They will be managing the transfer and provision of refugee support to Greek NGOs and government bodies. **Sofia invited us to visit UNICEF in Athens on another delegation. A Priority issue for GSC is for supporters in the UK to push harder for unaccompanied child refugees to be accepted into UK. Only six unaccompanied minors have been accepted to date from Greece. Under the Dubs agreement so far 90 places have been offered for unaccompanied child refugees in Greece to come to the UK. Greece has ‘many extremely vulnerable’ child refugees who need to be placed urgently.